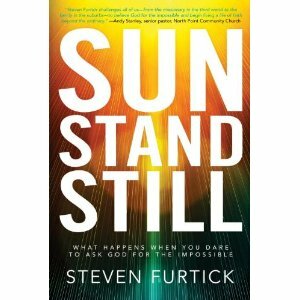 I recently read Steven Furtick’s book Sun Stand Still and it deeply impacted the way I pray and believe God for mighty things. John Starke, of The Gospel Coalition, just reviewed Furtick’s book here: The Gospel Coalition’s blog. My best friend, Chad Newton, likes to interrupt my work by sending me things like this to get my opinion. So I responded to his request in a message, which I posted below. I appreciate Mr. Starke’s review, but disagree on some points. But first, let me preface this by saying that I am the young Reformed type I refer to in my essay. So many of the points I make are directed to myself and my own theological community. Enjoy. It seems that Mr. Starke read the book quickly. I understand his concerns and even shared some. But I do feel that Starke speaks for the crowd of folks who I wish would be required to read Furtick’s book: namely the YRR crowd with often limited faith and unlimited pessimism (of which I am a part). Now don’t get me wrong. I am a huge proponent of understanding doctrine and studying theology. I am also a proponent of the idea that God answers prayers according to HIS will, not ours, and that some are indeed destined to a life of ordinary influence and consequence. However, I do not think Furtick contradicts either of these ideas in his book. Furtick’s point is, as Starke correctly points out, to propel individuals to dissatisfaction with mundane life. It is true that, throughout Sun Stand Still, it seems that Furtick argues that every believer ought to be doing something absolutely astounding with their life. But at further study, I think he makes a strong effort to explain that mundane and extraordinary look vastly different to different people. For everyone, Furtick argues, and himself included, leaving a godly legacy through his/her children is the most extraordinary of accomplishments. The same is true for marriage. Furtick elevates (no pun intended) marriage and family over ministry and is very clear in the book to communicate that this is where ministry starts. But his point, I think, is to spur us on to believe the impossible, to pray like only God can answer our prayers, and to believe that God can accomplish the extraordinary (no matter how mundane it may seem to someone else) in our lives. Starke does make some great observations and is not far off in many of his critiques. I particularly agree with his comment that Furtick spends too much energy on the potential of the individual over that of the church. The church is indeed God’s primary vehicle for salvation from Acts until he returns. But the idea that each person has enormous potential for ministry is not foreign or unbiblical. Take Thomas’ ministry in India and Philip’s in Samaria for example. These men launched out in ministry before their churches were founded. Granted, there was a sending enterprise in the Jerusalem church, but each man fulfilled enormous individual potential. The same is true for other great men of the Christian faith throughout history. But I agree that this ought to be in tandem with the church local. The same is true for many young reformers like myself. We tend to intellectualize faith rather than pray for it, speak it, claim it, and ACT on it. We’re often far too comfortable with preaching it and, if we fail, oh well…it must not be God’s will for me to have a dynamic life and ministry. I think it does come innocently enough. For the reformer, the goal is to make God look as big as He is. As such, God gets all the credit, all the glory, and I am subject to His will. Yes. But that does not mean that God is so big He would never choose to use someone like me to accomplish His purposes. Nor does it mean that I get to play no significant part in the story He’s writing. For men like Furtick and many of our charismatic brothers and sisters, they seek to try to make God seem as big as He is by showing His power to do big things through small people. And I can’t say that I disagree one little bit from either approach. God is big. Infinitely so. He “shows mercy on whom he shows mercy.” He uses whomever He wants. But I do absolutely believe that something extraordinary is available for every believer who, through faith, trusts God for it. I, for one, am sick and tired of dry but educated faith. I say, let’s keep growing in our doctrine and understanding of the Word, keep preaching it faithfully, and go do something with it! And that’s what I feel Furtick was primarily trying to communicate to his readers. I hope that wasn’t too convoluted or confusing. It felt a little like ranting. Ha. In any case, Furtick’s book is well worth a read. It should be pointed out that both John Starke and Steven Furtick are doing great things for God’s Kingdom! I deeply respect both men and do not seek to stir any controversy or offend either (as if they’d read this ha). Obviously I think that, for someone who may be more immature in their faith, this book may have more of a detrimental effect on them than on someone who has a right understanding of the power and neccessity of praying in faith. Particularly those with charismatic leanings. I have seen those folks take Gideon as an example of what it means to have great faith when in reality he had great doubt. Or is God always going to speak to us through a donkey? Or is one only saved if they have an Acts 9 type of experience? No. Obviously these were exceptions in which God chose to show Himself mighty, and are not to be taken as a normative means of how he works. That’s the only place where I could see this book being abused. However, on the YRR side of things, the overall lack of faithful, expectant prayers is incredibly disappointing. I think many of us have more of a cessationist bent than we may want to admit. The tangible moving and working of the Spirit is a bit too scary or perhaps uncomfortable for many of us, I believe. We will do whatever it takes to not be associated with charismatics in any way, shape, or form, which quite honestly, isn’t always a bad thing : ). At any rate, it’s very easy for us to be so scared of looking like a charismatic that we altogether stop praying for God to do great and mighty things. Should we be praying to be pastors of megachurches and leading global revivals? I suppose that lies in your motives. If it is a true, God-given burden, and your only desire is to see souls saved, then I would say by all means, pray it. If it’s what God wants, it will happen. I just don’t think it’s good when the motive is popularity or fame or what have you. Sometime it’s even the feeling people get when they think that they’re not good Christians (or not as good as they could be) if they’re not in one of the five-fold positions of ministry. What a tragedy that is! And I would hate for that to be the overall message that people are getting from this book.